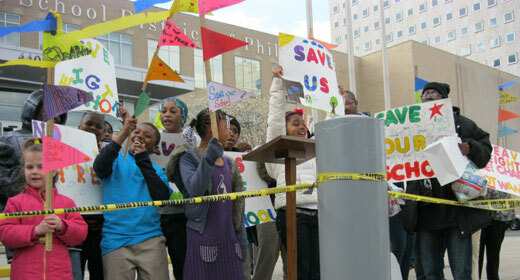 PHILADELPHIA – As this city’s School Reform Commission prepares to roll out a plan for the radical “restructuring” of one of the nation’s largest school districts, resistance and apprehension are building among education activists and supporters. The plan calls for the closing of 64 of the district’s 249 schools over the next five years; it would increase the number of charter schools in the district and decrease the number of schools directly under the supervision of the central office. In fact the central office would be virtually dismantled and much of the district’s operation would be conducted by local “achievement networks” of 20 or 25 schools, which could be run by private contractors, universities, or local groups. The district’s plan is not winning wide approval. 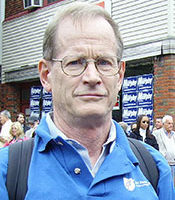 Teachers’ union president Jerry Jordan branded the proposal a “cynical right-wing, market-driven” attempt by the SRC to hand off the main responsibilities of running a public school system. Two active student organizations – Youth United for Change and the Philadelphia Student Union – issued a statement expressing their “deep concern about the direction the district is taking,” and about the possibility of recycling the now-discredited privatization plan of a decade ago. The school district’s proposal is being driven by its inability to fund the program currently in place. In March, the district put forward a $2.5 billion budget with a projected shortfall of between $185 and $218 million. The origins of the district’s financial problems lie, in part, in a decade of state management. In 2001, the state legislature eliminated the local nine-member school board and replaced it with the five-member School Reform Commission, appointed by the governor. Republican Tom Ridge, governor at the time, claimed that the action would cure the district’s fiscal and educational performance problems. Another part of the state’s proposed solution was to allow for the establishment of charter schools to operate at public expense within the Philadelphia school district. While the charters are located in the district and are nominally public schools, each one has its own school board and is largely exempt from district oversight. Its teachers may organize a union but they may not join the 18,000-member PFT, which represents district teachers, librarians, counselors, secretaries, classroom aides, and others. After a decade of state control, the district’s financial condition is worse than ever. The district now includes 80 charter schools, which enroll approximately 25 percent of the city’s K-12 students. In a recent op-ed piece in the local press, teachers’ union president Jordan detailed the increasing costs to local districts that the state’s approach was having on school budgets. He pointed out that the state had, for the previous eight years, partially reimbursed local districts for the cost of charters, but that the administration of new Republican governor Tom Corbett had ended this practice last year. In fact, the Corbett Administration has imposed steep cuts in the general education budget for all school districts across the state in the last two years, another immediate cause of the current crisis. The SRC has, over the past months, been revealing its agenda and its approach to finding “solutions.” It has made no secret of its hiring of the Boston Consulting Group to make recommendations for “overhauling” or “restructuring” the district. In December, 47 school nurses were laid off, and many schools were left without nursing services or coverage. The district has issued layoff notices to the members of SEIU Local 32BJ, District 1201 who make up a good part of its non-teaching staff: bus drivers, custodians, building engineers, and others. These workers would be rehired only if they agree to work for the lower prices quoted by outside bidders according to the District’s “Chief Recovery Officer” Thomas Knudsen. It has not escaped the notice of many in the labor movement and their allies that, of the district’s current shortfall, $110 million is listed as “new debt service,” which means payments to banks. In other words, workers are getting layoff notices while the banks will get paid. School nurses have organized weekly rallies outside the school district headquarters to protest the layoffs. The proposed changes must still be presented and approved by the SRC at a future meeting, where the Commission will have to face the sentiments and hear the concerns of the Philadelphia school community.